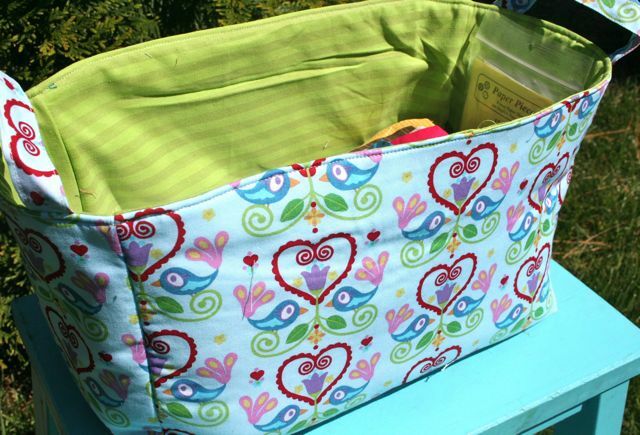 Of the three larger fabric buckets, I’m pretty sure this is my favorite one. 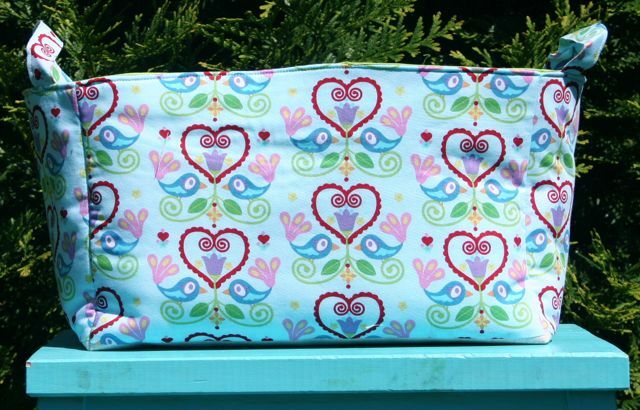 This is an older Farbenmix print I got from the same stashbuster sale where I scored the Heather Ross squares–I tell myself I love it because I lived in Germany when I was small, but really, it’s just a stinkin’ cute print in fantastic colors that go with everything else I own. I just love looking at this one. Interior is lined with the same stripe as the Anna Maria bucket, this time in the lime colorway. This one has become my handwork basket, and is actually holding two different projects, side-by-side. (Lucky for me, y’all have convinced me to put together a tutorial for these little buckets, so I’ll have a chance to make a divider bucket for this puppy–keep an eye out on Monday for the step-by-step!) These two projects used up the larger scraps in my collection, ranging from 8″ x 8″ down to 4″ x 4″ or so. I make no secret of the fact that I am completely obsessed with hexies, pretty much in any form. I love teaching the English Paper Piecing class over at the shop, and spreading my own particular hexie virus all over, ALL OVER. 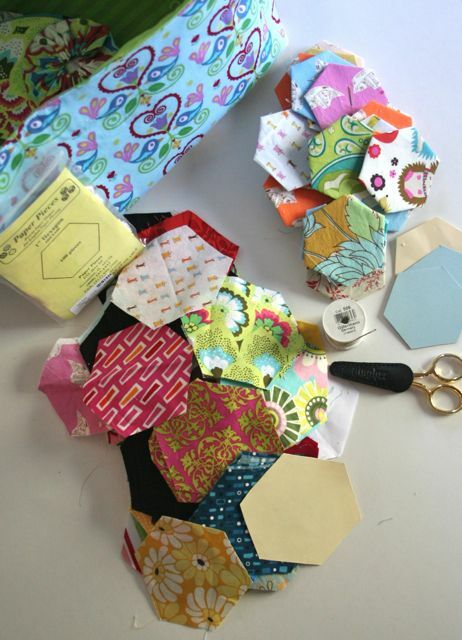 This particular pile started with the Heather Ross Macaroni Love Story fabrics from Spoonflower–the scale of those fabrics lends themselves really nicely to the 1.25″ hexies. I cut piles and piles of templates from card stock (using the hexagon graph paper generator), then another template with an extra 1/2″ seam allowance all the way around (classic English Paper Piecing uses 1/4″ seam allowance, but I like the extra margin that 1/2″ permits)–the second template makes it easier to cut hexies using my rotary cutter. Naturally, as I was working, I started flashing back to all the really amazing hexie pieces I’ve seen, and decided I just HAD TO make a scrappy hexie project. So, here we are. Hundreds of cut hexagons later. Fortunately for me, making yo-yos is super simple–to the point that I’ll be roping my entire family into making some with me in the coming months. What says “summer vacation” better than sitting around with all your family, stitching up some yo-yos? We might let my brother-in-law off the hook, but only if he provides musical accompaniment on guitar while the rest of us work. Finished yo-yos measure about half the diameter of the circles used to make them, so these are all cut to 7″. 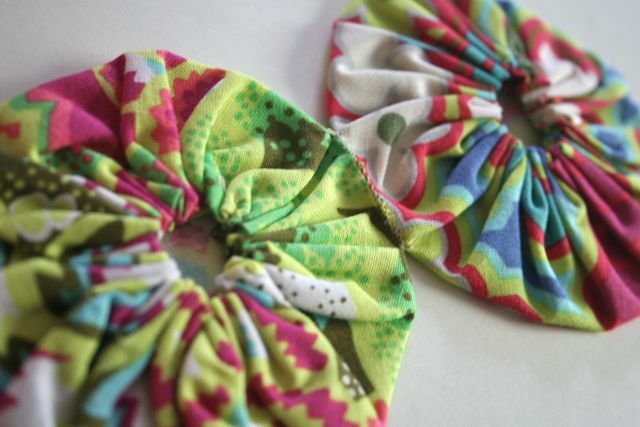 To put together the yo-yo, fold under 1/4″ seam allowance, and hand-sew a running stitch through the seam allowance and outer fabric. 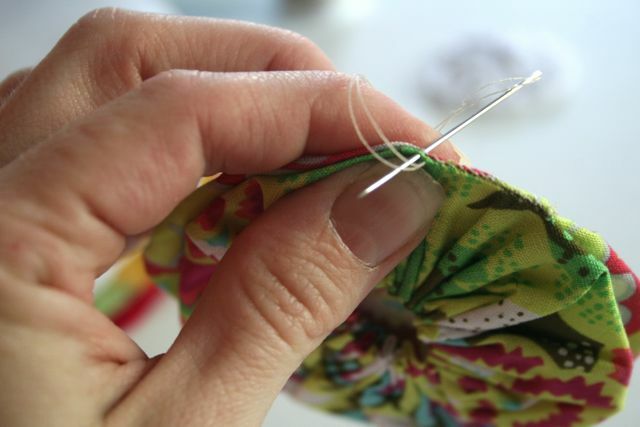 Gather up lots of stitches on the needle before pulling it forward and allowing the edge to slightly gather. 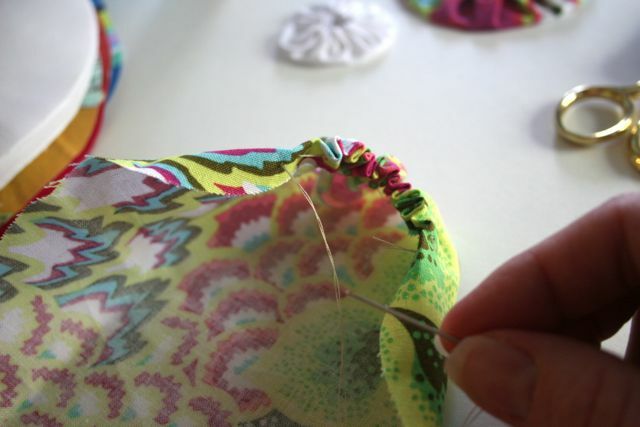 I’ve seen some yo-yo instructions indicate pressing the seam allowance under before stitching, but that slows me down and delays my sewing, so I don’t usually bother. There are also yo-yo makers out there–let me know if you love yours, since I haven’t used one. Work your way all the way around the edge, finishing right where you began. 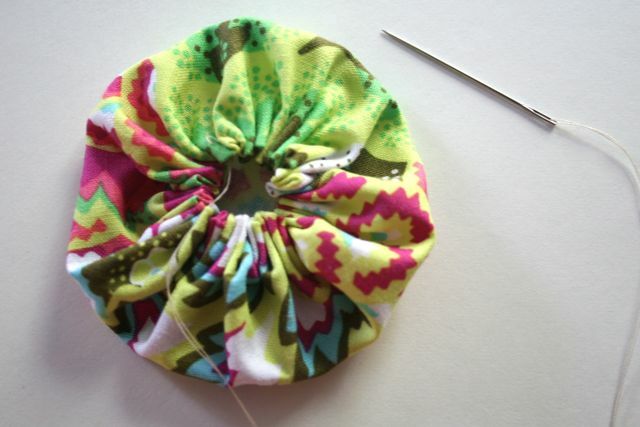 Draw up the entire edge into a nice gather, then smoosh the small gathered opening back on top of the yo-yo. 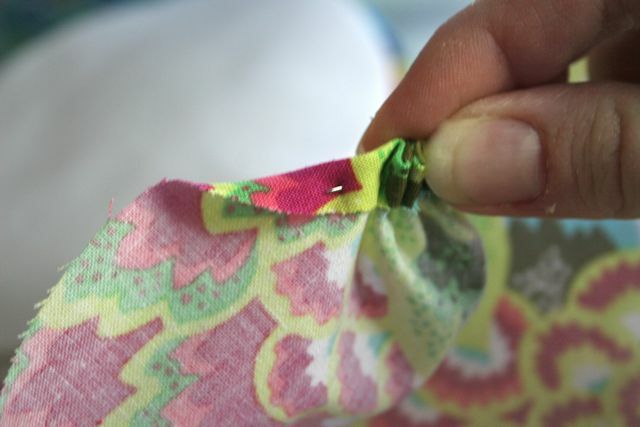 Press to reduce bulk and neaten up the edges. When you’ve got a mess of yo-yos all done, stitch them together edge-to-edge. Keep going, and you can make any size quilt or wall-hanging you’d like–I’d love, love, love to see one where the colors of the yo-yos have been used to make a portrait of some kind, wouldn’t you? There’s also a McCall’s pattern for a yo-yo top for ladies that intrigues me. For me, I’ll be mixing up my yo-yos with a clean, white Kona cotton. 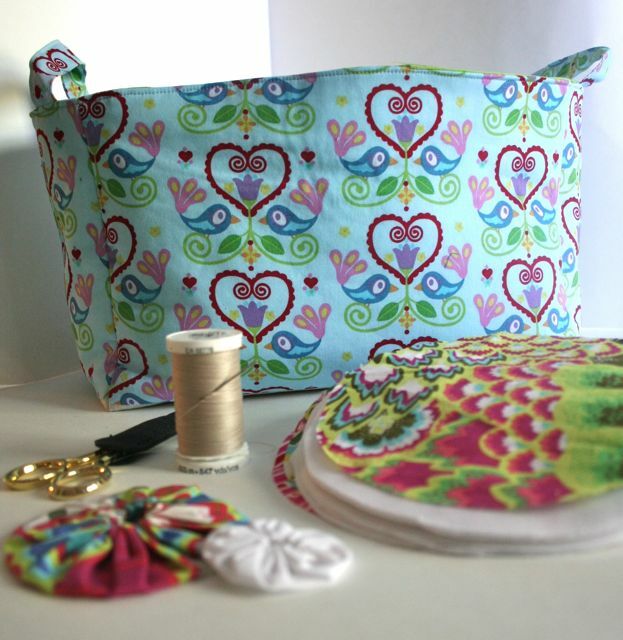 Planning out the design is a nice daydreamy activity as I stitch: should I do a diagonal? diamonds? alternating white and colors? I don’t know yet, but I’m looking forward to finding out. Tomorrow: the last of the scrappy buckets! Yay! She’s doing a bucket tute! She’s doing a bucket tute! I’m with Kim. (jumping up and down): a bucket tute! I have your book but really a bucket tute here is fabulous!! I remember that yo yo quilt at Quilt Market. It was beautiful & took my breath away as well. Not sure if I have a photo, but I’ll check and send it if I find it. Oh, that would be great, thanks! I dig the live music while we sew concept. Maybe a new house rule, “If ye shall not sew, ye shall make beautiful music”. yes, that’s perfect. Yeah! I’m so glad you are making us a tutorial. And thanks for the yo-yo tutorial. I have an antique? (my Nana gave it to me) yo-yo pillow that my toddler loves. I think he just likes saying yo-yo. Maybe I’ll let him pick fabric and make a pillow for his big boy bed. I LOVE my Clover Yo-Yo Maker!! It is a wonder and saves so much time! If you love making yo-yos now, you’ll be down-right addicted after you use a yo-yo maker!